Get Nike Roshe Run promo codes and save on these best running shoes of the year. As running shoes, the success of Roshe Run has been phenomenal. It is simplistic in design, without any needless embellishments. With an unprecedented comfort quotient, Roshe Run is soft and well cushioned and feels as if you are wearing a fuzzy sock. It is less expensive than many of its counterparts and hence, reaches a larger population. The shoe was designed by the talented Dylan Raasch who was inspired by the peace and tranquility of a Zen Garden. Whenever you put on your Roshe Run, you are hit by snug, warm comfort with incredible light footedness. The toebox is covered with flexible fabric and takes on the shape of your toes. The shoes are breathable with a mesh outer layer (upper) that is soft and stretchy. The inner side of the mesh grips your feet to keep them in place without any restrictions in movement. The Nike Swoosh is eye-catching with its many colors. It is also available in classic black by popular demand. Roshe Run has thicker mesh along the sides to provide more support. The shoes can be worn without socks sans any discomfort, whatsoever. The Roshe Run is made with versatility in mind. It can be worn for walking or running, in even or uneven grounds. The cushy foam midsole offers greater impact protection and ventilation. The laces are slim and wind their way through four eyelets and ties up tightly to ensure balanced footing. The soles are thicker at the heels than near the toes. The underside of the sole is smooth and bouncy so that you feel like you are gliding along the surface. Roshe Run offers a host of benefits like excellent breathability and lightweight cushioning. It is built to provide premium comfort with a cushioned collar around the ankles for protection. The rubber waffle outsole offers more traction and sure footing on rocky terrains. The heel of the Roshe Run has a slightly rigid vein to keep the mesh in place. 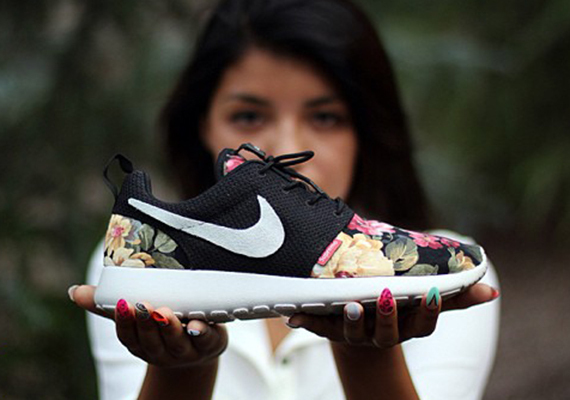 Nike Roshe Run is available for men, women and kids and is optimum for running on any surface. Available in a variety of colors and patterns and different graphics, the shoes are perfect for all age groups with its minimalistic design. Nike has introduced some more varieties in the Roshe Run looks department like Roshe Run GRAPHIC, Roshe Run Premium, Roshe Run Hyperfuse, Roshe Run NM, Roshe Run Woven, Roshe Run Print and more.